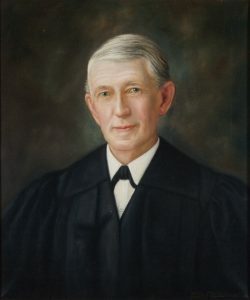 Appointed February 27, 1917, by Governor Henry Carter Stuart to fill the vacancy created by the resignation of George Moffett Harrison and began his service on March 22, 1917. Elected by the General Assembly on January 16, 1918, to a 12-year term beginning February 1, 1919. Service terminated by resignation. Author, Pleading and practice in actions at common law (1913). Photographic portraits, Washington & Lee University Library, from original glass plate negatives housed at the Virginia Historical Society. Appointed, Burks Appointed to Supreme Bench, Richmond Times-Dispatch (Richmond,Va. ), February 28, 1917, retrieved on March 14, 2014; qualified, 120 Va., iii; elected, Journal of the Senate of Virginia, 1918 Session, 66; resignation and death, 150 Va., iii; birth, education, and career, Charles V. Laughlin, “Martin Parks Burks, Washington and Lee University, 1917,” in W. Hamilton Bryson, Legal Education in Virginia, 1779-1979 (Charlottesville: University Press of Virginia, 1982), 117-126; and Peter Wallenstein, “Martin Parks Burks (1851-1928),” in Kneebone and Bearrs, Dictionary of Virginia Biography (Richmond, Va.: Library of Virginia, 1998), v. 2, 413; portrait, Library of Virginia catalog.